ROSEVILLE, Calif. (Oct. 15, 2017) - While Todd Gilliland and Chris Eggleston are taking the NASCAR K&N Pro Series West championship battle down to the last race, Michael Self is doing his part to steal some of the spotlight. Self wheeled his No. 9 Sunrise Ford/Eibach Springs/Lucas Oil Ford to the Toyota/NAPA Auto Parts 150 presented by TriCo Welding Supply victory at All American Speedway on Saturday night, and he did so in dominating fashion. Fastest in practice and the Coors Light Pole Award winner, Self led 137 en route to his second straight win. After losing the lead on the initial start, he reclaimed it on Lap 13 and never looked back, as he crossed the finish line 2.946 seconds ahead of eventual second-place finisher Gilliland. The win was the Park City, Utah, native's first at the northern California bullring, second of the season and eighth of his NASCAR K&N Pro Series West career. "I'm on top of the world right now," Self said, drenched in Victory Lane after his team doused him in celebratory fashion. "This is unbelievable, a great feeling to come and dominate the way we did tonight. In Bob Bruncati's car, with the Sunrise Ford colors on there, after we got our win (at Meridian) with the Sinclair colors on there. It's just capping it off, man. I think we had the momentum going at Meridian, and it carried over tonight. Just feels so good for these (No. 9) guys." The result at the third-mile short-track was Self's sixth top five and 12th top 10 of the season. He's now one top 10 shy of tying his career high, which he earned back in 2013 -- his last full-time season in the series. Bill McAnally Racing teammates Gilliland and Eggleston finished second and third, respectively. The two had combined to win nine of the season's first 10 races before Self interrupted their dominance of Victory Lane. With his second straight runner-up finish, Gilliland pushed his points lead to 11 over Eggleston heading into the season finale at Kern County Raceway Park in Bakersfield, California, on Nov. 4. "We're looking at the big picture," Gilliland said. "But for me, I really don't enjoy racing on these tiny tracks, just because you have to have so much discipline, and it's just really hard for me, I guess is the bottom line. These guys gave me a really fast NAPA Autp Parts Toyota Camry like always. But we just barely missed it in the race, so we're going to move on to my favorite track at Kern County Raceway Park." Eggleston's result was the 11th top five and 13th top 10 finish of this season. This was also the third time he has finished third in 2017. "The good news is we didn't lose any points. The bad news is we didn't gain any points," Eggleston said. "Me and Todd (Gilliland) were pretty evenly matched there navigating through lapped traffic. Nevertheless, I had a lot of fun out there. The No. 9 car was in his own zip code, but I had a lot of fun racing Todd right there. We obviously have to beat him to gain points, but overall it's a decent night." Sunoco Rookie of the Year contenders Derek Kraus and Will Rodgers rounded out the top five. Nicole Behar was sixth, followed by Cole Moore and Blaine Perkins as the final two cars to finish on the lead lap in seventh and eighth. Kody Vanderwal and Max Tullman completed the top 10, each finishing one lap down. 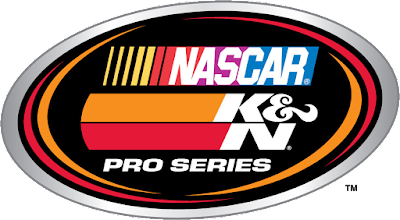 Behind Gilliland and Eggleston, Kraus maintained his third-place spot in the standings. While he's 81 back of Gilliland, Kraus holds a two-point edge on Rodgers and a four-point lead on Self for the final points podium spot. The Toyota/NAPA Auto Parts 150 presented by TriCo Welding Supply is scheduled to air on NBCSN on Thursday, Oct. 19 at 3:30 p.m. ET. 1. (1) Michael Self, Park City, UT, Ford, 150 laps, 70.325 mph. 2. (3) Todd Gilliland, Sherrils Ford, N.C., Toyota, 150. 3. (2) Chris Eggleston, Erie, Colo., Toyota, 150. 4. (6) Derek Kraus, Stratford, Wis., Toyota, 150. 5. (5) Will Rodgers, Solvang, Calif., Ford, 150. 6. (8) Nicole Behar, Spokane, WA, Toyota, 150. 7. (10) Cole Moore, Granite Bay, Calif., Toyota, 150. 8. (14) Blaine Perkins, Bakersfield, Calif., Chevrolet, 150. 9. (13) Kody Vanderwal, LaSalle, Colo, Ford, 149. 10. (12) Max Tullman, Chester Springs, PA, Ford, 149. 11. (11) Todd Souza, Aromas, Calif., Toyota, 149. 12. (15) Matt Levin, Tucson, Ariz., Chevrolet, 148. 13. (17) Stafford Smith, Eagle, Idaho., Ford, 148. 14. (18) Takuma Koga, Nagoya, Japan, Chevrolet, 148. 15. (4) Trevor Cristiani, Boise, Idaho, Chevrolet, 147. 16. (16) Ron Norman, Tucson, Ariz., Chevrolet, 147. 17. (9) Hollis Thackeray, Union City, Calif., Chevrolet, 146. 18. (22) Bill Kann, Scottsdale, Ariz., Chevrolet, 146. 19. (20) Jesse Iwuji, Carrolton, Texas, Chevrolet, 145. 20. (19) John Wood, Eagle, ID, Chevrolet, 145. 21. (7) Julia Landauer, New York, N.Y., Ford, 144. 22. (23) Josh Fanopoulos, Garden City, ID, Toyota, 143. 23. (21) Jonas Fors, Stockholm, Sweden, Ford, 59, clutch. Lap Leaders: C. Eggleston 1-13; M. Self 14-150. Standings: 1. T. Gilliland, 567; 2. C. Eggleston, 556; 3. D. Kraus, 486; 4. W. Rodgers, 484; 5. M. Self, 482; 6. T. Souza, 437; 7. J. Landauer, 419; 8. K. Vanderwal, 414; 9. B. Perkins, 411; 10. N. Behar, 410.